The elaborate flower arrangements adorning each table, the golden sheen of ring clad finger, the one-hundred plus guests eating decadent, meat filled pastries in a meticulously arranged venue and the cars used to get them there — all essentials of a wedding that share one defining feature: they all wreak havoc on the environment. With wedding budgets escalating to an all time high, and the wedding guest headcount growing exponentially, environmental consciousness can no longer be viewed as an afterthought. This isn’t to reprimand those who want a grand wedding — a wedding can be grand, but it must comply to one simple equation: the more elaborate the wedding, the greener the shade. For all those brides feeling affronted by the prospect of forsaking decadence for the green initiative do not fear; style and sustainability do not have to be mutually exclusive. In fact, choosing to “go green” can actually enhance the grandeur of the wedding, if planned accordingly. And with celebrities and style icons choosing to implement green design into their wedding scheme, the green wedding has never been more fashionable, or necessary. When it comes to the wedding day, green is the new white. Let’s start from the very source of the wedding — the invitations. Wiles Greenworld is redefining the paper industry using an innovative approach to creating paper materials. Using the “Cool Earth Paper” design plan, the business is not only trying to offset carbon emissions or re-plant replacement trees, it is supporting a project that is actually saving trees. They offer a range of wedding stationery, all of which can be custom made to suit your needs and your budget. When it comes to your selection of food, choosing a catering company that selects products from local, organic farms is essential to upholding the standards of the green wedding. Going local also means that you mitigate the travel pollution of transporting food costs as well as lessening the amount of packaging waste. Eco-Cuisine, the London based catering company, works solely with free-range or traditionally reared produce from sustainable farming methods. If you would fully like to accentuate the green catering design scheme into your dining decor,, opt for herb plants in terracotta pots, like basil or cilantro, that guests can directly add them to their dishes, providing a more interactive experience. 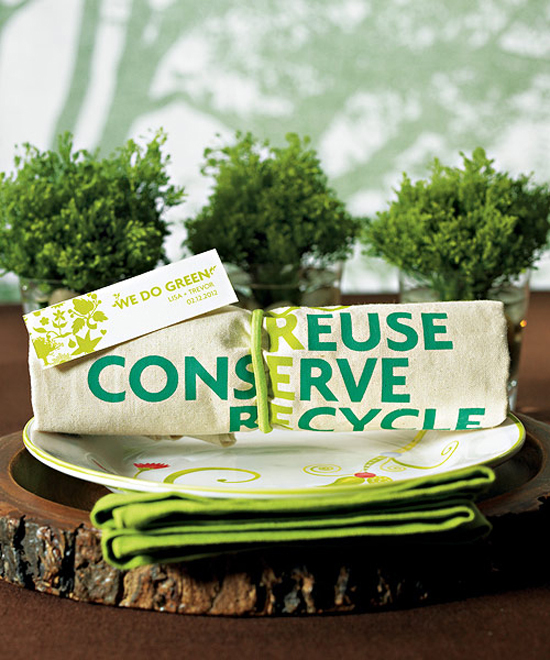 This one is as simple as being environmentally conscious of where the materials on your registry are sourced. Survey items that derive from organic materials — such as unique, bamboo plates or natural shampoo and bath products. Another option, for the few that are willing to forego the registry all together, there are many charitable alternatives such as charitable donations that go towards environmental organizations. If you don’t want to convert your entire registry into a charity, consider asking that a small percentage of all costs of items listed on the registry be donated to the charity of your choice. Weddings, although they are understandably a day dedicated to the love of two people, also have huge potential for charitable revenue. The idea of flowers having any sort of affiliation with environmental degradation seems counter-intuitive, and yet, 80% of all flowers are imported. Selecting locals flowers from within your country of residence will greatly lessen the environmental impact, travel expense, and support local business. Simply research online local flower shops in your area — there is an array of flower shops based within the UK. Yes, I realize the wedding dress is a touchy subject in the face of alternative solutions, however, there are simple ways to be environmentally friendly when it comes to wedding garb even if you choose not to alter your wedding dress itself. The most obvious eco-friendly choice when it comes to the dress is simply re wearing your mother’s gown, or buying a previously used, vintage dress. If mum’s dress is not an option, the latter is quickly becoming more and more popular for selecting a wedding dress that is authentic and traditional. Elizabeth Avey Wedding Dresses in London offers a treasure-trove of vintage, perfectly maintained dresses all from the 40s and 50s to suit your preference for the truly authentic, uniquely upholstered gown. As for the ladies of the wedding, consider rental dresses from sites such as Rent the Runway. They offer an extensive array of dresses to cater to the preferences of your bridesmaids. Whether you decide to commit wholly to the Green Wedding, or only partially work some of these alternatives into your planning scheme, you have already made a lasting impact on lessening the amount of pollution and wastes that is often inseparable from of the wedding day. The Green Wedding, depending on the bride and groom in question, can be seen as an exciting challenge or a natural lifestyle choice. Either way, it is necessary, and very achievable.